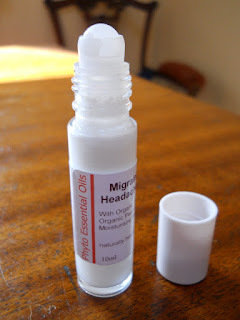 There is a way to deal with a headache or migraine without taking any tablets. No Paracetamol, no aspirin, Anadin, Nurophen, etc., etc. Our blend of organic Lavender and Peppermint is the natural alternative to pills and potions. Just roll onto the temples for an incredibly cooling, soothing effect. You feel a little tingle at first, which is a pleasant experience, then just relax, lie down if it's convenient, and soothe that headache away. £3.50 for a 10ml bottle.